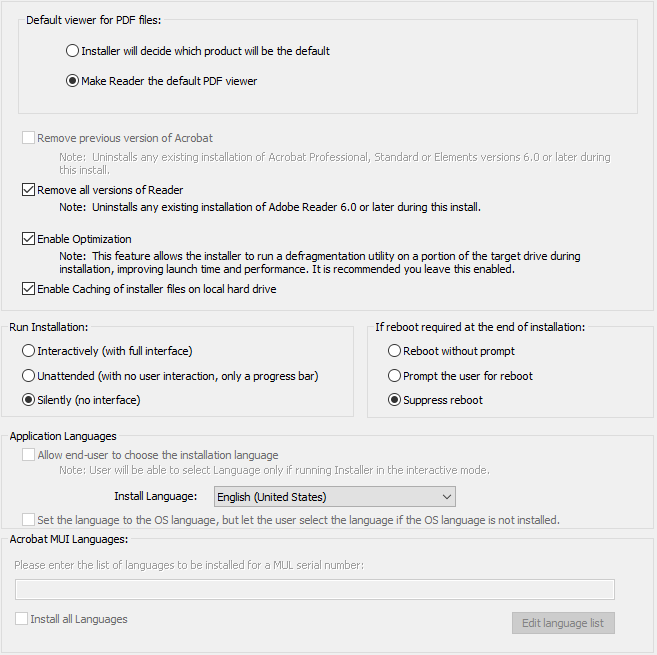 In this post I will show you how to create a MST file for Adobe Reader, another application that almost every single company use. For this application though, using ORCA isn’t the best way. It’s still possible, but you will see why it’s not recommended. 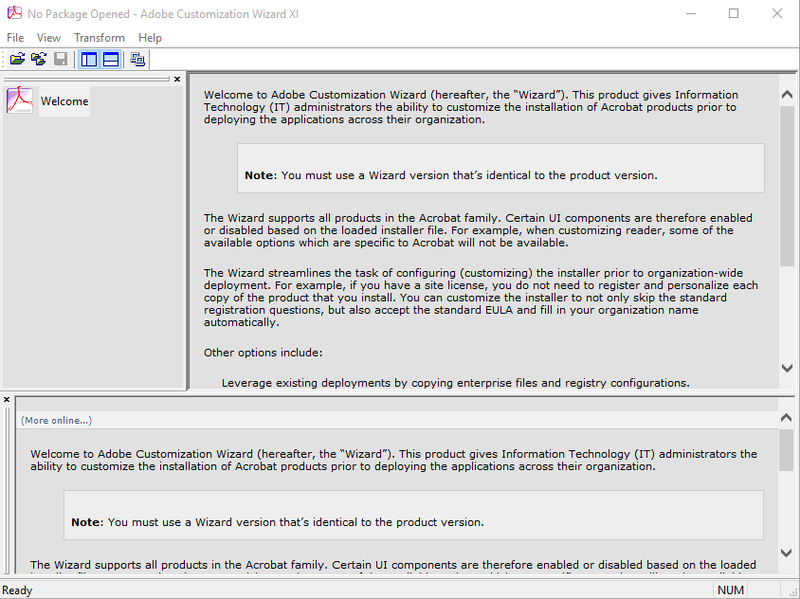 The process will be the same for the DC-version of Adobe Reader, but you need to download the corresponding version of the Customization Wizard that can be found here. Now we need to open the MSI-file that we will deploy to the clients, so from “File” go to “Open Package” and select the MSI-file that was extracted earlier. It should be called “AcroRead.msi” if nothing has been changed. From the first screen, the only thing we can edit is the “Installation Path”. This is because the standard Reader does not require a license. I will leave the installation path as default. Under “Install Options” there are a few things we can change to suite our environment. 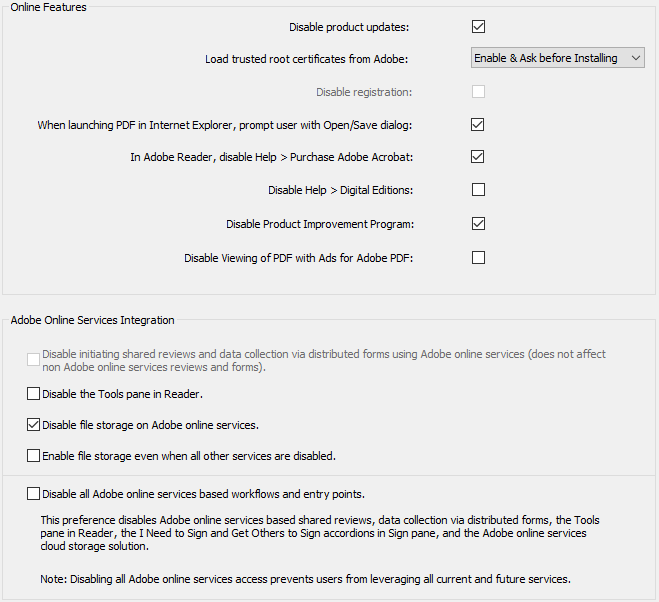 I always set Adobe Reader to be the default PDF-viewer. If you are running Windows 10, you might need to think about this one since Edge is great viewer for PDFs as well. Also, I make sure that the installation is completely silent and that all reboots are suppressed. Note: You will need one MST file for every language that you are deploying since the installation is completely silent. 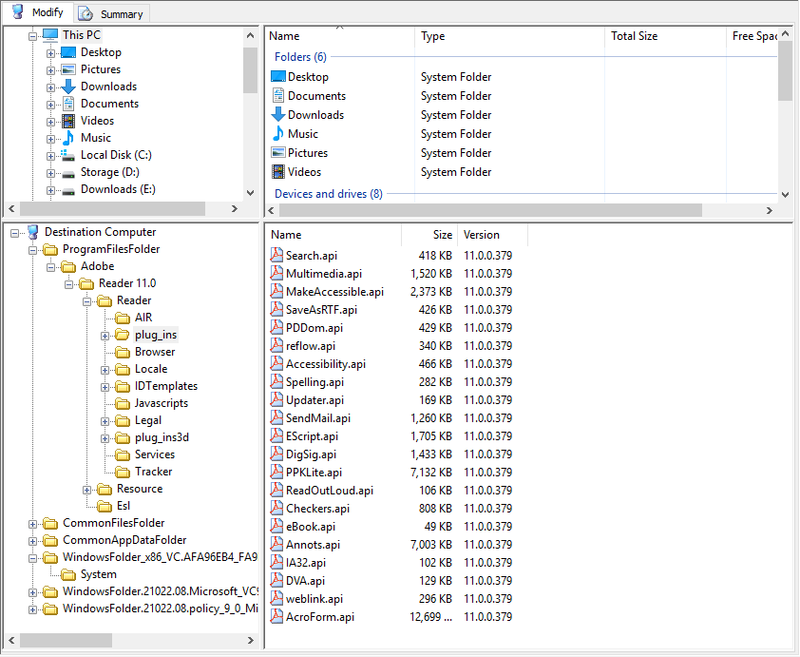 Under the next step, Files and Folders, you will be able to see exactly which folders are being created by the installer and which files are installed on the system. From here, you can add or remove files to the installation. This is perfect if you need to install extra plug ins for example, just drag the file from the above browser to the folder in the browser below. Under “Registry”, I wouldn’t recommend changing anything unless you know exactly what you are looking for. Adding or removing the wrong item here, could cause system instability. The next part is “Shortcuts”, from here I always remove the “Desktop”. This shortcut is one of the few that the user almost never uses. So go ahead and right click the shortcut and select “Remove”. Under “Server Location”, you have the possibility to add all the locations of where your package will be located. This is only used if you are planning on deploying the application through GPO for example, so it’s not needed if you are using SCCM or similar. “Security” is also something that we need to take a look at, normally when you install Adobe Reader, you do not get to set these settings. So either the user needs to change them, or you need to enforce them with a GPO. I normally set the values to the image shown below since enabling “Enhanced Security” will make the application take more time to open up files. 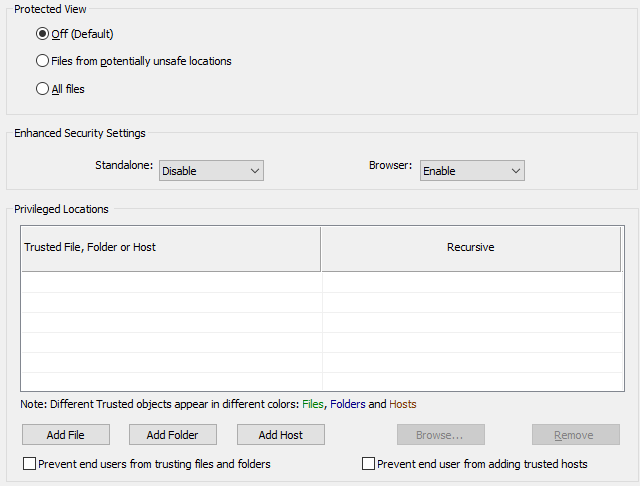 If you are using both “Protected View” and “Enhanced Security”, I recommend that you add locations for your internal shares to “Privileged Locations” to make the experience more enjoyable for the user when they are opening files from the local intranet and so on. The last part we need to edit is located under “Online Services and Features”. The remaining items are rarely used so I will not go into details about these. From here, I set the application to never update automatically or asking the user for updates since I wan’t to control what versions are being used in the environment. The other options I select are shown in the picture here are and are self explanatory. Now that we have done all our settings, we need to create the MST. To do this, go to “Transform” and select “Generate Transform”. A “Save As” dialog will appear and ask you for the file name that you would like to use. Depending on how many languages I need to create the MST for, I name them accordingly, for example “AcroRead_en-us.mst”. When saved, you can close the Customization Wizard. Note: If you have added files to the MSI, you need to save this as well, if not, click on “No” to exit. Now, in the beginning of this post I said it’s possible to use ORCA as well to create the MST, but if we load the MSI and apply the MST you will see why I recommend using the Customization Wizard instead. 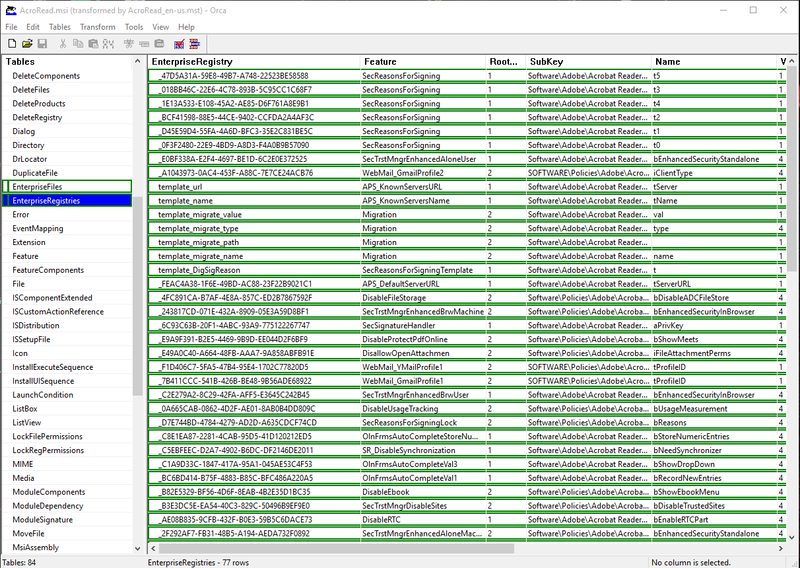 As you can see, even if we just added a few new settings and removed a few, a lot of new entries are created. I hope this guide has given you some insight in the world of MST files for Adobe Reader. if you have any questions, just add a comment and I will be happy to answer them as good as I can! For more guides regarding MST files, follow this link. This entry was posted in Applications and tagged Adobe, Adobe Reader, msi, mst, orca, Reader, SCCM. Bookmark the permalink.